The NATO-led force said Thursday a convoy fired "on what appeared to be a threatening vehicle." An imam died in the shooting. Kabul, Afghanistan (CNN) -- The NATO-led command expressed regret for a military convoy's killing of a religious leader Thursday in Afghanistan. The death sparked angry demonstrations near a U.S. military base. The convoy fired "on what appeared to be a threatening vehicle" and "regrettably" an imam was shot and wounded before later dying at a hospital, NATO's International Security Assistance Force said. The religious leader was identified as Muhammad Yonus, who headed Paktia Kowt Mosque in the nearby Ud-Khil district. The shooting occurred outside an American base on the outskirts of Kabul. The killing of civilians has strained relations between Afghanistan and the United States and its allies. The death comes as an international summit on the war gathers in the British capital. At the London Conference on Afghanistan, Afghan President Hamid Karzai announced a plan Thursday to integrate some Taliban fighters into mainstream society. But air bombings, escalation of force incidents at checkpoints and accidents that have led to Afghan civilian deaths have served to undermine international and Afghan efforts to win wider civilian support. "Despite all the measures that we put in place to ensure the safety of the Afghan people, regrettable incidents such as this one can occur," said Brig Gen. Eric Tremblay in an ISAF news release about Thursday's shooting. "On behalf of ISAF I express my sincere regrets for this loss of life and convey my deepest condolences to his family." The NATO-led force said that a "thorough investigation is being conducted" and "appropriate action will be taken to ensure that the personnel complied with our policies designed to protect the civilian population." The numbers of civilian casualties have fallen off in recent months since Lt. Gen. Stanley McChrystal took over as U.S. commander in Afghanistan. "While we cannot replace the loss suffered here today, compensation to the family for their loss will be in accordance with local customs," ISAF said. Yonus, 36, was sitting in a parked car with his two young sons, waiting for a convoy belonging to ISAF to pass, witnesses said. 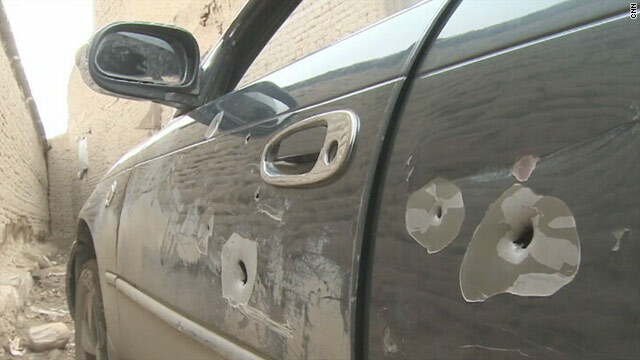 The fourth ISAF vehicle opened fire without provocation, according to the witnesses. Abdul Ghafar, chief of criminal investigation for the Kabul police, said ISAF forces opened fire because the man got too close to the convoy. Later, his car was moved to the yard of a nearby house. Residents said Yonus was hit four times -- three bullets entered his chest; one hit his abdomen. He died on arrival at a hospital. Angered by his death, about 150 people demonstrated outside Camp Phoenix, but the district police chief persuaded them to disperse. Violence also flared in southern Afghanistan as the NATO-led force reported the death of a U.S. service member by a roadside bomb. It also reported 12 to 20 insurgent deaths in an airstrike targeting insurgents who launched rocket-propelled grenades at troops. That strike took place Wednesday in northern Afghanistan's Baghlan province.